This blog is starting to look like the obits! Anyway, Mike Smith, lead singer for the Dave Clark Five, died of pneumonia. Drummer Buddy Miles, who worked with Jimi Hendrix, died earlier this week. The Providence Phoenix has nominated the Narrows for its "Best Folk Venue" award. But to receive the award--and tons of free publicity--the Narrows needs your vote. If you enjoyed your time at the Narrows we hope you'll take the time to vote for us. Note: after you hit "submit" you need to hit "next" and get to the end of choices in order to submit your name and email address. If you don't, your vote won't be counted. Go to the voting site by clicking here. Our friends the Wood Brothers are coming May 15. You may have seen them at the Narrows Festival for the Arts. Chris Wood, by the way, is a member of jam banders Medeski, Martin and Wood. Check 'em out at www.thewoodbrothers.com. Also, British singer/songwriter/guitarist Steve Tilston is scheduled for May 23. Don't know much about him, but you can learn more at www.steve-tilston.co.uk. The shows should be posted very soon at www.ncfta.org. Narrows alum Kathleen Edwards has a new album out, and Rollingstone.com has written a quickie review. 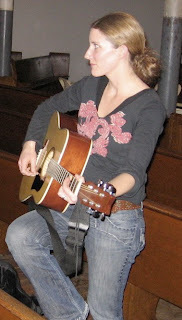 Above is a photo of Kathleen strumming her guitar in the Narrows "pews" after her show in 2006. Drew Glackin, a member of Narrows alums The Silos, died unexpectedly recently. Your humble Backstage Blogger also remembers his performing at the Narrows backing another artist, but my memory fails me. For more about this loss, click here. Also, producer Teo Macero, who worked with Miles Davis, Dave Brubeck, Robert Palmer, has left the studio. Here's a NY Times write-up about him. It was New Orleans, Jamaica and Margaritaville at the Narrows as Martha's Vineyard-based Entrain got a packed house moving and grooving on Saturday night. It was drums, drums and more drums, sax and trombone, guitar, keys and what have you, as the group never slowed down, switching instruments and bouncing from reggae to ska to rhythm and blues to rock. No Depression magazine, one of the best publications covering the artists who perform at the Narrows, is going out of business this spring. The wonderful art exhibit Pulp Function has arrived at the Narrows! At this writing Narrows volunteers were still putting the exhibition together--but your humble blogger snapped a few shots to give you a preview. More details at www.ncfta.org. Roots wranglers Ollabelle made a triumphant return to the Narrows Sunday night before a large, appreciative crowd. Amy Helm, however, couldn't do the gig because she gave birth to a baby boy a few days ago. So Martha Scanlan, in the photo above, not only opened the show but filled in. Kinks guy Ray Davies is releasing his second solo CD. The Boston Globe has posted a review, which you can read here. Laura Ingraham, national conservative talk host, lists Diamonds in the Dark by Sarah Borges and the Broken Singles as one of her favorites. Sarah and the guys are an official Narrows' "discovery." Great music rises above ideologies, I suppose. Check out Ms. Ingraham's list here. Eric Lindell and his six piece band brought in a huge crowd Saturday night who danced to its rollicking New Orleans sound that's seasoned a wee bit with reggae and other influences, including the movie "Easy Rider." The group covered that flick's "Don't Bogart That Joint," an inspired choice nobody expected in a million years. The group--including two sax players who have also worked with the Iguanas and Walter "Wolfman" Washington--was fresh off an appearance on Conan O'Brien's show the night before. Maybe bring these guys back to the Narrows Festival for the Arts at the end of the summer? What do you think? We're not sure what pedal steel great Buddy Cage is up to with this Marge-Simpson-Meets-Phil Spector hairdo, but it didn't get in the way of his playing with the New Riders of the Purple Sage at the Narrows Friday night. A packed house whooped and boogied as these psychedelic space cowboys made their second visit to the Narrows, and kicked off their 2008 touring schedule. The wonderful jazz group the Charlie Hunter Trio is returning to the Narrows in April. Last time they were at the Narrows their concert was one of the year's highlights. Jazz and Jam fans: this show is for you. Ticket info should be posted soon at www.ncfta.org. 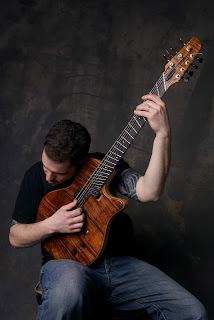 By the way, Charlie plays an eight-string guitar, although I only count seven in the photo! Not yet posted--March 21 guitar master Larry Coryell will be gracing the Narrows stage. Larry has been called "a true pioneer of rock-jazz fusion" by the New York Times. He's played with Charles Mingus, Chick Corea, etc., etc. Keep an eye out for more information at www.ncfta.org. Well, it's done and posted: the video from Narrows faves Sarah Borges and the Broken Singles. It's for the song Stop and Think It Over. Dig it by visiting www.sarahborges.com. Sarah returns to the Narrows in a few months. Above, that's Eilen Jewell backstage (so to speak) about a half hour before she headlined at the Narrows on Saturday night. Last year was a great one for Eilen and her group as their CD Letters from Sinners and Strangers received national acclaim and radio airplay. Eilen was gracious to note during Saturday night's show that the Narrows was one of the first places to take a chance and book her and the boys. The Narrows' faith in Eilen seems to be paying off--according to our observation, she drew double the audience from the last time she visited us; a fairly large and enthusiastic crowd that seemed to know her songs. Congrats to this talented young woman! Her hard work is paying off! Ollabelle is returning to the Narrows very soon (visit http://www.ncfta.org/ for more info)! They've played the Narrows several times and have blown the house away. This is a guarantee winner if you're into roots music. Absolutely brilliant stuff! Amy Helm, of Ollabelle, is the daughter of Levon Helm, formerly of The Band. Last year was big for Levon, what with an extremely successful album (Dirt Farmer) and all. And Amy helped to make it happen for her dad. Paste Magazine talks to Amy here. The wind blew and the rain fell, and, Friday night, upstairs at the Narrows the stories they did tell. First, opener Michael Troy set the tone with his original ballads of the mills, hills and spills of Fall River. Headliner Rosalie Sorrels, in her first appearance at the Narrows, sang of love, hopping trains and waltzing with bears, and talked of friends and acquaintances like Hunter Thompson, Ken Kesey and Rev. Gary Davis.